Klingons, holodecks and new worlds: VFX secrets from the latest small-screen Star Trek voyage. Inspired by Jonathan Swift’s Gulliver’s Travels, American screenwriter and producer Gene Roddenberry sought to explore intellectual themes within suspenseful spacefaring adventures with Star Trek. A cultural phenomenon was born, consisting of seven television series and 13 feature films spanning 52 years. The latest small-screen incarnation is Star Trek: Discovery. In this article, we board the USS Discovery to learn about the visual effects and 3D art expertise needed to envision a universe consisting of Klingons, alternative realities and holodecks. 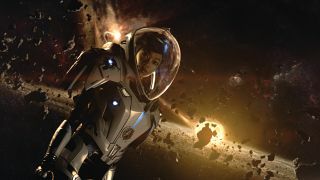 Discovery takes place a decade before the original TV show with the primary objective being to honour the legacy of the franchise. “I thought this was a great opportunity, but also daunting,” notes production visual effects supervisor Jason Zimmerman (Sleepy Hollow), who looked after the creation of just under 5,000 shots and received a VES Award nomination for the pilot episode. Pixomondo handled 1,700 VFX shots, with the Toronto facility responsible for 90 per cent of the work while Los Angeles produced the previs, Frankfurt assisted with creatures, and additional support was provided by Stuttgart; the main vendor collaborated alongside Crafty Apes, Ghost VFX and Spin VFX. “As for the world building it goes back to the legacy of Star Trek, doing a lot of research, working with the art department, and integrating things based on the lighting in the footage,” notes Zimmerman. A new workflow was born from Page being transformed into a horned demon as part of a research and development project with Hetrick, to figure out how to take ZBrush into 3D printing into makeup and the steps required. A franchise mainstay are the Andorians. “I took existing features and refined them because that’s what it needs to be sometimes,” says Page. Glenn Hetrick is part of the Star Trek loyal fanbase. “The passion for the franchise creates an impetus in the level of design and the physical work that we’re doing on Star Trek: Discovery.” Mission accomplished for Zimmerman. This article was originally published in 3D World, the world's best-selling magazine for CG artists. Buy issue 234 or subscribe.